Love Inspired Books is Looking for New Writers! Don't miss this great opportunity to get your story in front of the Love Inspired Books editors! left to right Elizabeth Mazer, Emily Rodmell, Emily Krupin, Giselle Regus and Shanna Asaro. picture at the Love Inspired Reader Luncheon. 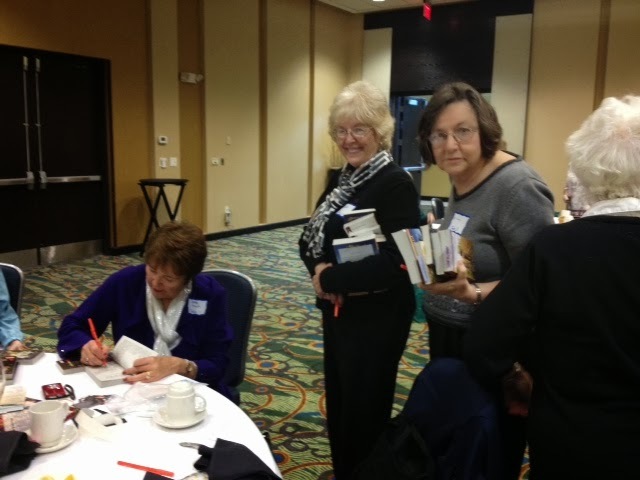 Love Inspired Books hosted their first Reader Luncheon on Thursday, January 30, in Tampa, and I was thrilled to be able to attend. Fellow authors Missy Tippens and Patty Smith Hall and I had planned to fly to Florida on Wednesday, but as you probably know, Atlanta shut down due to a snowstorm. Our flight was cancelled, and we were rescheduled for an early Thursday morning departure. I left my house at 5 AM, and although the roads were icy, I arrived at the airport safely and made the flight without problem. By 10 AM, we were at the hotel and excited about the day ahead. The ballroom was filled with enthusiastic readers eager to meet writers and talk about the Love Inspired books we all love to read. Each person who attended received a swag bag filled with goodies, including lots of books and cute Love Inspired coffee mugs. In addition, our wonderful publisher had copies of our latest releases for the readers, free of charge, and we had time to personally inscribe the books we gave away. Julie Jeftich won my basket! for a seat at my table. Hors d’oeuvres were served while we mixed and mingled, and prior to lunch, the authors rotated tables at ten minute intervals—like Spin Dating—which gave us a chance to get to know more of the lovely ladies who attended. 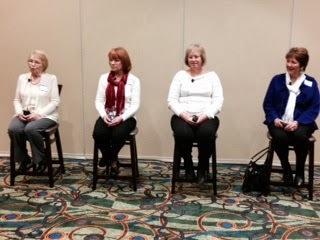 A few of the authors were on a Q&A Panel with the readers fielding questions and getting a behind-the-scenes glimpse into our lives as writers. The atmosphere throughout the day was warm and welcoming and filled with smiles and hugs and lots of laughter. The Reader Luncheon was a special opportunity to make new friends and share our love for books, especially Love Inspired stories, with so many delightful readers. after a wonderful day with Love Inspired readers! Thanks Dianne Moggy, Harlequin VP for Series Editorial and Subsidiary Rights, Love Inspired Senior Editor Melissa Endlich and Lucy Scinocca, Harlequin Direct-to-Customer Sales, for coordinating the luncheon. Thank you, Harlequin and Love Inspired Books, for creating a memory I'll always treasure. Eight years ago, a drifter destroyed Becca Miller's ties to her Amish community—and murdered her family. Now a special agent with Fort Rickman's criminal investigation department, Becca knows her past has caught up with her and doesn't want to relive it. She's convinced that the killer, who supposedly died years ago, is very much alive and after her. Special agent Colby Voss agrees to help her investigate. Yet the closer they get to the truth, the closer the killer gets to silencing her permanently. On sale March 1! Pre-order here.